Quick wrap up of the last few posts here on Never Enough Nails: I "hated" magnetic polish, then I actually tried some, now I love it. 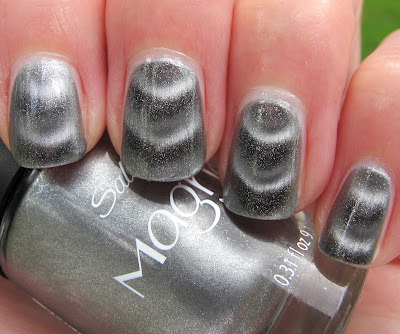 That leads me to today's post featuring the lovely Sally Hansen Silver Elements magnetic polish. 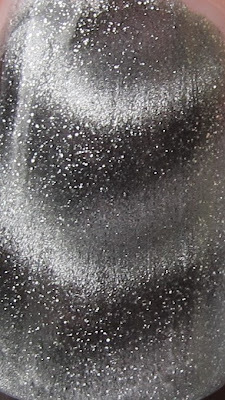 Silver Elements is a shimmery silver polish that develops dark silver and white accents after you use the magnet. Now, if you read my post about Sally Hansen Polar Purple, you know that the Sally Hansen magnetic polishes have a little plastic guide just next to the magnet on the cap. You rest this guide actually on your skin, so that the magnet is super close to your nail, but not touching your wet polish. I did a little experiment here, just so you could see. On my pointer finger, I held the magnet close to my nail, but did not have the guide touching my skin. For all the other nails, I had the guide touch, as directed. You can see how much clearer and darker the magnet patten is on the nails I used the guide for. Definitely use the handy tool Sally Hansen put there for ya! Overall, the Sally Hansen magnetic polishes are easy to use, gorgeous, and the magnets work quite well. I highly recommend them if you're in the market for a magnetic polish! The Sally Hansen Magnetic Nail Colors are available at a drugstore near you! I just am not a fan of the whole magnetic polish - I don't know why I just can't get it on my good side. Peace, Love and Polish- I know how you feel. Sometimes there are trends that not everyone will like! I probably won't buy a lot more magnetic polish, but I'm glad I have a few now :). Me too Liz!!! I like this polish alone, without the magnet pattern too!